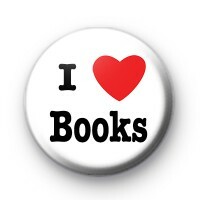 25mm I Love (heart) Books Badge. It seems that reading & books have had such a revival in the past few years, maybe thanks to books like Harry Potter & Twilight. They have inspired a whole new generation of readers. Our book & reading themed badges are great badges for book clubs, schools or avid readers out there. Also a wonderful badge for World Book Day.